Lawmakers have passed a budget deal that will increase deficits by $320 billion over a decade or almost $420 billion with interest and sets the stage for adding $2 trillion to the debt over the next ten years if parts of the deal are made permanent. 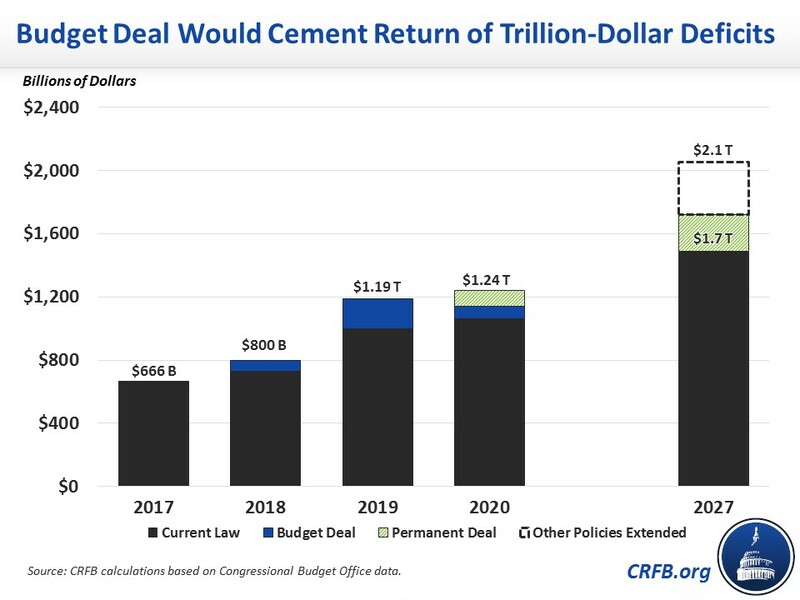 The deal would significantly increase caps on discretionary spending by $296 billion over the next two years, provide nearly $90 billion in disaster relief, increase spending on health care in multiple ways, and retroactively extend tax breaks that expired at the end of 2016, among other policies. The deal includes roughly $100 billion of offsets, though many are budget gimmicks or one-time savings like selling oil from the Strategic Petroleum Reserve. 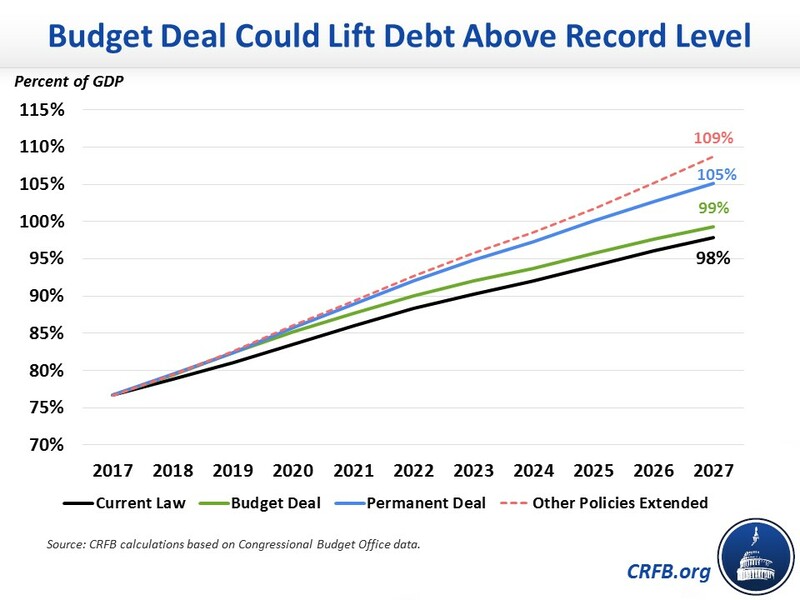 The budget deal itself would cause debt to rise to 99 percent of Gross Domestic Product (GDP) by 2027 – but if made permanent, debt would rise to 105 percent of GDP in 2027. With other tax provisions extended permanently, debt would reach 109 percent of GDP, higher than the previous record of 106 percent of GDP set just after World War II. After a $1.5 trillion tax cut and with debt already higher than at any time since the World War II era, it is clearly time to get to work on enacting changes that remedy this dismal fiscal situation. Scaling back the tax cut, finding common-sense spending cuts, and enacting reforms to unsustainable entitlement programs will all be key to reversing the harm caused by reckless deficit-financed tax cuts and spending increases.